The story of how Curiositi, a startup based in Bangalore, India implemented ERPNext to manage their business of educational kits. While learning from the books helps us learn about the concepts, practice and real-life experience is what helps us understand it’s why and how. Has learning Science been one of the biggest gripes you ever had as a child? You wish that you could conduct those fun little experiments mentioned in your textbook? Curiositi is a solution for you. Curiositi is a startup based in Bangalore, India which aims to bring fun back to learning by making it a hands-on, activity-based rather than the usual boring learning process. They provide learning kits and worksheets for students right from Kindergarten to Grade 10. As Albert Einstein said, ‘ The true sign of intelligence is not knowledge but imagination’. Unfortunately, education is now about boring textbooks, tuitions and exams. They decided to make a dent in the world and change that. Curiositi are a passionate group of teachers, product designers, technologists and ops gurus, backed by global investors who share their vision. Just like the ecosystem has it (especially in India), they started using Tally to manage their accounting books and fulfill statutory requirement like a good citizen. But here is the thing with Tally, it has scalability issues. Curiositi experienced a good traction for their products, operations scaled many folds very quickly. New locations were set up and things got decentralized. But their offline accounting package remained centralized. An inflection point when you make a Google search “ERP for Indian business”, and there we were, ERPNext. We'll let Manoj share his story on this one: "Before ERPNext, our business resided scatter across various business apps, ranging from accounting package to excel files to an inventory app. Being a multi-city operation with operations, accounts, and sales scattered across three locations, disparate old-style PC software was a huge headache. The biggest value of implementing ERPNext was the integration of all our business processes like inventory, manufacturing, and accounts, with seamless data entry and operation across all 3 sites. The solution scaled up to support our 150 different end-products that we manufacture from an inventory of over 2,000 Raw Materials and Components. We just loved it! "Since ERPNext is a cloud-based application, it did a great deal by allowing us to outsource our accounting to a CA firm. All they needed is a login to our ERPNext account. Our operations enter the sales, manufacturing and purchase transactions in ERPNext. And our accounting firm picks it up from there to complete the accounting jobs, prepare reports etc. To sum it up, ERPNext directly helped us in running a business without a dedicated accounting department. "The affordable pricing of ERPNext was a big factor due to which we could implement ERPNext in our early days. Implementing ERP without digging the hole in your pocket? It’s possible with ERPNext. "Scalability is a good problem to have, and ERPNext is all set for it. We sell through multiple platforms and want to have all the information synced into one place. Down the road, if we decide to build extensions to help us speed up workflows especially in our B2C, e-commerce and logistics side, the Frappe Framework is enough powerful and compatible to allow us to achieve it." Manoj loves the point that ERPNext brings inventory, accounting, and manufacturing all under one roof. He also likes the ease of use compared to other offline products they tried in the past. The cloud model ensures easy collaboration between their Procurement, and operations team and their accounting firm who pick up after. So just like activity based learning helps you understand the concepts better, same works for the ERPNext as well. You don't need a classroom and a tutor to get the implementation right. Just create a trial account and get dirty. Hence consider this story as also a case of activity-based learning, where a tutor was missing and a kid taught a concept of an ERP solution to oneself. Sounds interesting? It just happened at Curiositi! What's your ERPNext story? We would love to cover it under our ERPNext Customer Story series. 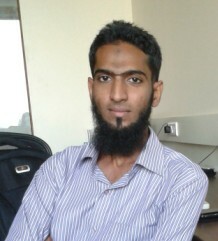 "Umair is the Chief Customer Officer at ERPNext. He has done more than 50 ERP implementations remotely and replies to most incoming inquiries."